Good morning. I’ll be announcing the winner of my Reader Giveaway and the 1,000 AAdvantage Miles and the Marcus Samuelsson Gourmet Cookie a little later today (speaking of winning miles, don’t forget it’s MondAAy at the Frugal Travel Guy and the Deal of the Day is sponsored by AAdvantage. Share your best AAdvantage tip with his readers for a chance to win 2,500 AA miles). Friday I asked readers whether they preferred to use a paper boarding pass or to use AA mobile app digital version. Out of the more than 150 responses, paper was the overwhelming choice. I can’t function without my iPhone and I’m a big fan of the mobile app, but I’ve never had to reboot or recharge a paper boarding pass – they work for me every time. Besides, I’m kind of a traditionalist. And as Darren Booth wrote the other day, “BPs printed from web check-in just aren’t exciting“. The brushed aluminum finish goes back to the 1930s. Company President, C.R. Smith disliked painted planes for aesthetic reasons. In the 1980s CEO Bob Crandall decided against painting the aircraft because the weight of the paint increased fuel consumption. The classic branding and logo were introduced in 1967. It was created by acclaimed graphic designer Massimo Vignelli. In a note on his website he writes “AmericanAirlines logo half-red, half-blue, in plain type stresses the professional, no gimmicks attitude of the company in the colors of its home nation”. So what do you think? Vote and share your comments. 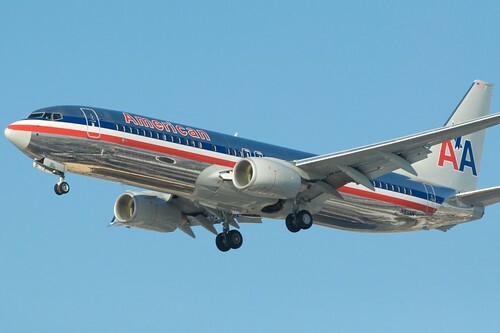 Should American Airlines change their livery and their logo? Yes. It needs to be updated. Besides, new beginnings require a new logo. No. It's a iconic and timeless. As modern today as 1967. Change the logo. Change the branding. But don't paint the plane!! Photo: Shiny: American Airlines 737-800 N8111NN, landing YYZ. I think the polished aluminum is classic and was ahead of its time. However, after seeing what Apple has done with brushed aluminum I often wonder how that would look on AA aircraft. I’m okay with a re-branding, but keep the unpainted aircraft. It’s too cool. It evokes a bit of Delorean in me. I will admit to feeling a bit cautious flying a plane carrying the word “American” and red, white and blue- following 9/11. Perhaps a more global branding while maintaining the unpainted metal feel would be actually quite refreshing. I never cared for the unpainted look, and the current logo makes me think “old, boring people.” Full speed ahead with rebranding. My issue is that many of the planes look really bad. The brushed metal looks incredible when its new, better than paint. BUT when its old, it looks way worse. From what I understand the 787 cannot be brushed metal due to the high amount of CFRP. I think the planes should be uniform. I’m ok with gray, but consistency is key! Please not another all white plane with a dull logo and font – we’ve seen enough of these lately, no? I think the planes are in desperate need of a livery update. Whenever I go take photos at LAX I can’t help but think how outdated the plain aluminum exterior looks. But I agree with Stephan above, please do not simply paint them white with a logo. If they are going to update the livery they need to make it look unique. Also, with the 787 coming they are going to have to update it unless they want the 787s looking different from the rest of their planes. I don’t really care what the outside of the plane looks like. Make the seats better or something useful like that with this money. Justin and Noah are right on target regarding the 787. While current aircraft are metallic and shiny when they leave the plant, the 787 without paint is black due to its carbon fiber body. I suspect whatever design they come up with for that aircraft will slowly spread to the rest of the fleet.